Use strands of white lights to make your diamond party sparkle. A diamond-themed party can turn a variety of occasions -- birthdays, anniversaries, fundraisers or weddings -- into dazzling and glitzy affairs. Sparkling decor sets the stage for your event. The theme can start with the invitations and be carried through to the party space, the table settings, the drinks you serve and even how the food is plated. Your invite can stylishly introduce the glimmering themed party, giving a glimpse of what is to come. Start with a silver or pearl-toned piece of card stock. Use vellum paper to print out the details of your event using a gray font. Trim the paper a half-inch smaller than your card stock and affix the paper to the card using a glue stick. Strips of rhinestone trim can be found at fabric stores and used to embellish invites. Glue the trim to the edges of the card for a sparkling border. Start with strands of clear diamond-cut beads to create a curtain to adorn the entrance of the party space. Place a large mirror on the main wall of the room to reflect the lights and sparkle. Drape strands of rhinestones and beads from the branches of large plants. Lastly, create a budget-friendly crystal chandelier-like element using faceted glass balls and clear Christmas ball ornaments. Attach different lengths of sheer ribbon to the balls and, using thumbtacks or small nails, fasten the stringed balls to the ceiling, hanging over the table. 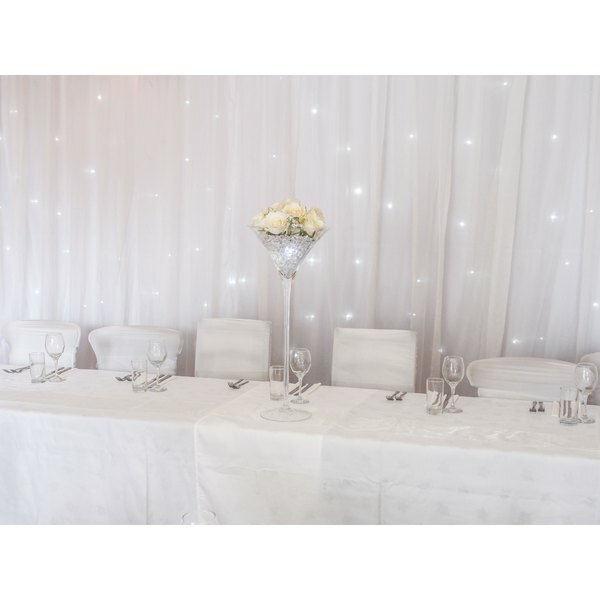 Dress up a table with a sheer white table cloth adorned with accents by gluing silver rhinestones or sequins to the cloth. Use bejeweled vases to showcase an array of white flowers for the centerpiece. Place diamond-shaped candle holders fitted with tea lights around the vases. Add even more shimmer to the table by using crystal plates atop shiny silver chargers. Lucite-handled flatware can complete the place setting. Create a simple glittering place card holder by taking a clothes pin and covering the top in silver glitter. Print guests' names on place cards and adorn the cards with stick-on jewels. Slip the glittered pin onto the card and place one at each setting. Use edible bling such as crystallized sugar and sugar gems to top desserts and rock salt to top savory bites. For extra sparkle, plate appetizers on cut crystal or silver platters. 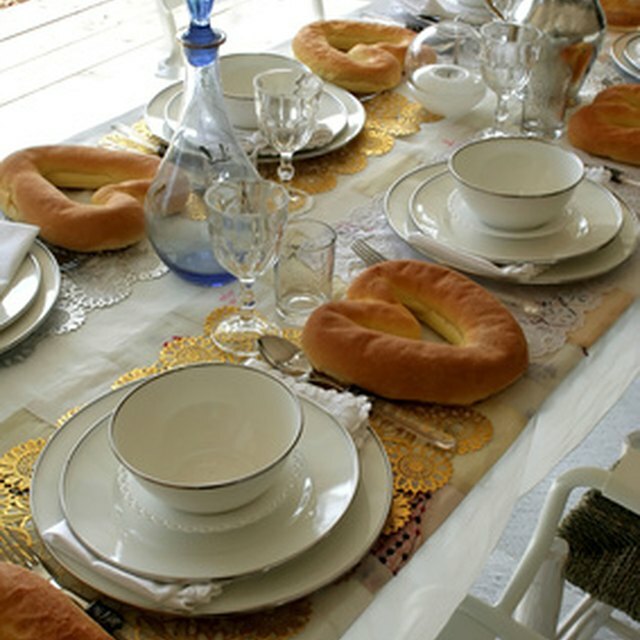 Tiny silver or crystal plates and bowls can also be used to serve the goodies. Affix rhinestones onto the end of silver toothpicks or skewers with hot glue, then use them to spear and serve hors d'oeuvres. Serve beverages that sparkle such as champagne, sparkling liqueurs or mineral water in cut crystal goblets. Rim cocktail glasses with fine silver sugar and garnish the drinks using clear acrylic cocktail picks.